The juniors enjoyed their tri at Lake Alexander yesterday morning. At this later stage of their calendar, they are demonstrating great tri skills and are indeed very proficient (I saw some mounts and dismounts yesterday that would cause some of our senior members to blush!). That’s all thanks mainly to Jason Jones & John Thyne who have patiently guided the juniors through their skill sessions and at events. Thanks to Jason, John and swim buoy extraordinaire, Belinda Rowley and all the other wonderful volunteers who helped out yesterday. (See also Jason’s junior report below). 4. Juniors (13+) wishing to enter NT Junior Triathlon Championships should have necessary cycle skills to ride on open roads. We had a fantastic turn out yesterday morning for our second last event of the season, held at Lake Alexander. Again, all participants were put through a rigorous warm up/skills session prior to racing. We then had a 2 race sprint event for each junior category (Seniors/Juniors/Sub Juniors). Time handicaps were given after completing the first race to provide an incentive for all competitors. The first race was led by the seniors with some very fast and efficient transitions showing the younger ones how it’s done. The juniors had the greatest numbers and therefore a congested swim leg. Things spread out through the 1st transition onto the bike with a flurry of sprint finishers on the shortened run course. A special mention to Aida Hansen, the only Sub Junior today who managed to pass a few Juniors in the first race even after starting after them! The handicapper had the stopwatch out with all splits taken to stagger start the 2nd Race hoping to get a 'pack' finish. Interesting to see the back markers from the first race embrace the early start and never look back as they relegated the quicker pacesetters to the middle of the pack. Great to see we had 8 families with 2 or more brothers/sisters competing today. Also waiting on the sidelines were some younger siblings (too young to compete) either watching/cheering or at the swings waiting for the post race refreshments and frozen poppa's!!! Next race for all the juniors is the Teams Event on the 28 April 2013 starting at 7:30am. This is held in conjunction with the adults race so to avoid parking congestion please to arrive by 7am. The bike course for the juniors will be cross country so no Road Bikes please. We'll organise Junior Teams during our regular warm up session. We will complete proceedings with a sausage sizzle and junior participation medal presentation. 2. Tara Worby is sporting road (or is that path) rash after taking a tumble while out running. We wish Tara a speedy recovery. 3. Frustration for Renae McGarvie, who lost her timing chip at Mooloolaba Triathlon yesterday, as her pb is not yet showing up in results. 5. Registration for Sunday’s (Race 2 Sprint) event is creeping towards max numbers. Don’t forget it closes when full or midday Friday. No late entries taken. Get your registration done online here now so you don’t miss out. 6. Online entry is also open here now for the Ray White Darwin NT Sprint Distance Triathlon Championships (Sunday 7 April 2013). Only first 100 entries receive goodie bags so get your entry in quick as there are not many left. This is also likely to fill to capacity prior to closing date so please get your entry in asap. 7. 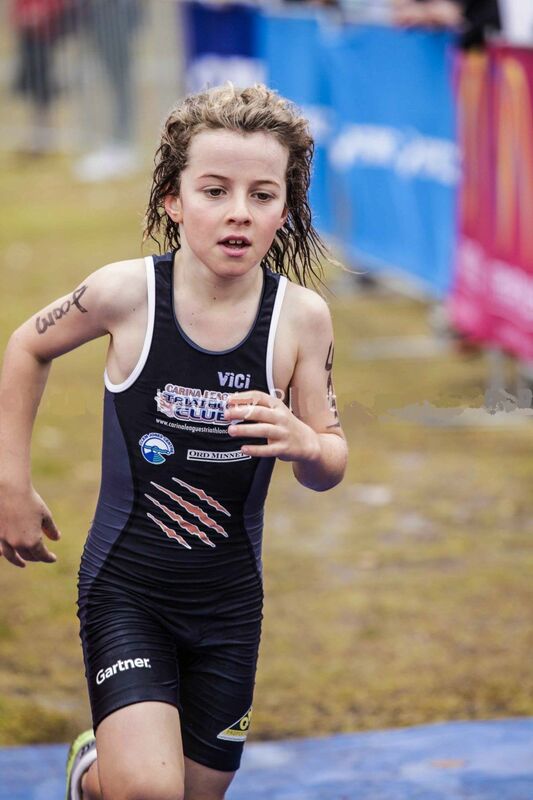 A good news story – many of you will remember the very enthusiastic Malo Gilly who honed his tri skills at our junior events last season. Malo recently took out the 7-9 yrs category of the Gatorade Junior Series in Qld. Well done Malo – it has to be due to great start in tri that he got here in Darwin!